What is it about rings that make them so fun to eat? Is it the fact that you can line them up on your fingers and nibble them off one by one? Or because you can loop your tongue around them so easily whistle enjoying each piece? For a perfectly peachy sensation, take a bite out of these delicious orange, red, and yellow candies! Chewy, fruity, and dusted with just the right amount of sugar, you taste perfection every time you taste a Trolli gummy. 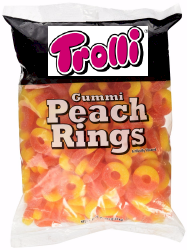 Bag contains 5 pounds of Trolli Peach Gummy Rings Candy.